Discover the amazing creatures of the underwater world at SEA LIFE Kansas City Aquarium, where you'll see thousands of tropical fish and more at 30 unique displays. See blacktip reef sharks and catch a glimpse of different species of rays and even a giant pacific octopus. Test your sea knowledge on a quiz trail and try out Doodle Reef, where kids can create their very own virtual sea creatures on a screen within a live display! SEA LIFE Kansas City provides visitors with a mix of educational and interactive activities through more than 30 aquarium displays that feature diverse ocean species in authentically themed habitats. 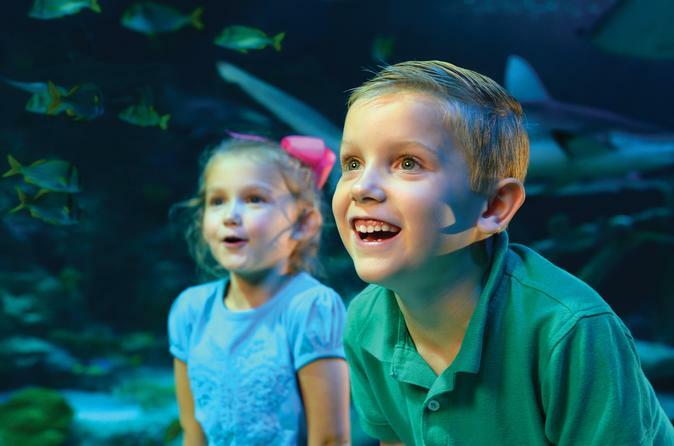 See thousands of creatures as you make your way through exhibits that include an ocean tank and underwater glass tunnel — you’ll find something for every member of the family. Spy the elusive giant pacific octopus, considered the most intelligent of all invertebrates, and discover why its favorite meal consists of shellfish and crustaceans. Watch a variety of tropical seahorses slurp up their food and don't miss the rescued green sea turtle on the ocean floor. Observe cute clown fish and see jellyfish floating inside cylindrical tanks that mimic ocean tides and currents. Stop by an ocean tank of blacktip reef sharks which come from the coral reefs of the Indian and Pacific oceans and watch them swim overhead via an underwater tunnel. You'll also spot cownose rays which use their synchronized flaps to stir up ocean sediment on the tunnel floor. Learn about the creatures that inhabit the shores and coastal tides such as starfish, sea anemones, sea urchins and horseshoe crabs. Passionate about preserving marine habitats and the species that live in them, the informative staff at SEA LIFE Kansas City celebrates everything about the sea. The aquarium hosts educational demonstrations and shark and ray feedings throughout the day. Learn about successful breeding programs for endangered animals and discover how the aquarium supports worldwide conservation projects. Special Offer - Price displayed includes a 17% discount off the local admission price! - Book Now!